If your ladies' night usually involves a round of cosmos, you’re in for a real treat with these ginger cosmopolitan cocktails. They have the same pinkish color we’ve all come to love in our cocktails, yet the addition of ginger makes them a little sassy — and even more perfect for enjoying with friends! The cosmopolitan cocktail first hit the bar scene in the late 1980s. Dale DeGroff was credited with creating the cocktail, although he states in his book, The Craft of the Cocktail, that rather than create the recipe, he "popularize[d] a definite recipe that became widely accepted as standard." While we love this cocktail as much as the next person, we also like to sometimes switch it up a bit by adding different liqueurs or using different main spirits... Tequila cosmos, anyone? In this variation of the cosmopolitan, we swapped out the citrus vodka for ginger vodka and also added in some ginger liqueur. 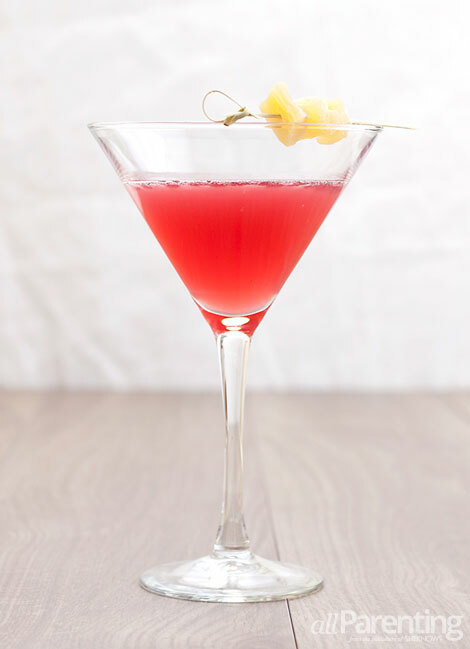 The result is a beautiful pink ginger cosmopolitan cocktail with hints of spice from the ginger. Add in some candied ginger for garnish and your cocktail is ready to enjoy! Add all ingredients except for the garnish to a cocktail shaker. Fill 2/3 full with ice, shake and strain into a chilled cocktail glass. Garnish with candied ginger on a skewer and enjoy!